Heavy Weight – 4 Cycle Stomper Rental – Stone XH840, available for rent from the Duke Company in Rochester NY, Ithaca NY and the entire Western New York region. 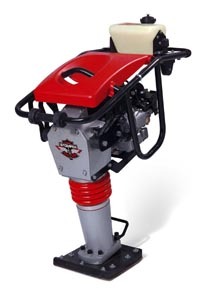 Heavy weight 4-cycle Rammer / Stomper® model – superior impact of any 4-cycle rammer . Ideal for compacting footings, foundations, utility lines and other heavy-duty jobs. Impact force: 3,500 lbs. Weight: 154 lbs.